The Free Culture Foundation is warning that Google, Microsoft, Netflix, and giant Hollywood music and movie companies, are pushing for an extension to the HTML5 standard that will give them control over who can access web content. 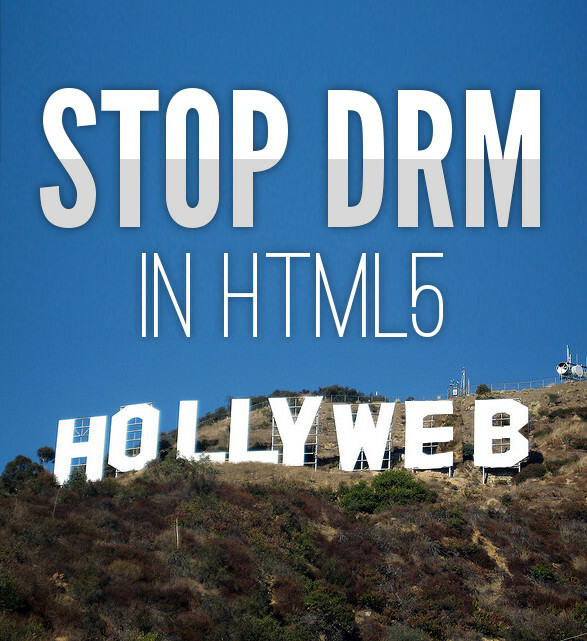 DRM in HTML5 is a betrayal to all Web users and undermines the W3C's self-stated mission to make the benefits of the Web "available to all people, whatever their hardware, software, network infrastructure, native language, culture, geographical location, or physical or mental ability." The move would legitimize proprietary plugins from companies such as Adobe, Microsoft, and others, as HTML5 standards, when one of the goals of HTML5 is to remove the need for proprietary plugins. It would be a terrible mistake for the Web community to leave the door open for Hollywood's gangrenous anti-technology culture to infect W3C standards. It would undermine the very purposes for which HTML5 exists: to build an open-ecosystem alternatives to all the functionality that is missing in previous Web standards, without the problems of device limitations, platform incompatibility, and non-transparency that were created by platforms like Flash. - Organize the development of high-priority projects that support our mission."